Back before streaming audio, and before the limitless listening options offered by the first commercially successful MP3 player (Diamond Rio), we listened to radio. We had entertainment and listening options all up and down a frequency scale ranging from 550KHz – 1600KHz (AM), or 88MHz – 108MHz (FM). All we needed to do was turn the dial of a radio and move a sliding pointer along a band of numbers until we heard something we liked. For those of us who felt “limited” by the popular listening options, we preferred using a multi-band radio. Multi-band radios gave us far more choices for listening to the many frequencies filling the airwaves. But as with many popular fads, they can get squeezed out by newer entertainment technologies. But the same cannot be said for the Rhapsody RY-610 radio. I personally own this Rhapsody RY-610, and as one of the various heritages it is a part of, it was built with a design that had managed to last. This radio is suspected to have been first manufactured sometime in the mid to late 1980’s. That is technically unconfirmed outside of the fact that it appears to be a clone of a radio sold under different brand names. The same radio can be found as a Radio Shack SW-100 (catalog #12-649), first appearing in their 1993 catalog and last sold around 2003 (with a modified case design). Through the “grapevine” in various online forums, it is also expected to be a clone of the Canadian marketed Venturer 2959-6. Then again, it’s not all that uncommon to find consumer electronics marketed in this fashion. PB: a.k.a. “police band.” Until the recent changes to digital and secure communications standards, you could most likely hear your local police department on this band ranging from 145MHz to 175MHz. 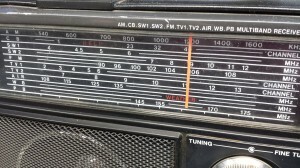 A radio like this would STILL be perfect for nighttime Summer and/or Fall backyard listening, or as something to do out in “the boonies” when camping. With the fire roaring from the pit, and little other noise than the insects during a clear night, you could switch to the SW1 and SW2 bands and listen to the strong shortwave broadcasts emanating from around the world. In fact, you can still listen to them today, consisting of foreign and native language programs broadcasting music, news, and even propaganda. As I type this, I’m listening to Voice of America somewhere around 6MHz on the SW1 band. This radio is designed to be as versatile as possible to operate. It has three separate power options. It can run on four D-cell batteries, or via a built-in (and stowable) AC line cord, or by the use of a 12DC external input, the latter allowing the radio to run off of a conventional 12V socket in a vehicle (with the right cable). After powering up the radio. I tried to listen to the AIR and PB bands for anything interesting. Unfortunately, most of my local emergency services have switched to “digital trunking” radios and are no longer able to be heard in their original, conventional form as a VHF (Very High Frequency) broadcast. So basically, those bands on this radio have been rendered mostly useless in this area. I can still receive (on occasion) the transmissions for old fashioned, but still in use, audio pager services, but those tend to get boring real quick. I also haven’t picked up a single aircraft transmission. I’m guessing there have been changes in the way aircraft radio operates. They probably use the same frequencies, but the signals could be modulated differently (i.e. digital). Speaking of being rendered useless, the TV bands also serve little purpose anymore. A couple years back, television channels have converted to digital form and we can no longer hear the audio broadcasts from television station using radios like this. Perhaps someday, those frequency bands may once again be repurposed for other broadcasts which we’d be able to receive, provided those broadcasts are frequency modulated in the same way the old TV channels used to be. Now on to the CB band. CB, or Citizen’s Band radio, was alive with chatter back in the days when multi-band radios first became popular. I suppose it was still left in this design for nostalgic reasons as well as the fact that CB radio still exists. But I believe that gone are the days when we had the ability to listen to the “truckers” talking about “putting the hammer down” and pointing out which bush “smokey bear” is hiding behind. Today, as I go down the band looking for local chatter from the truckers on the highway running near my house, I hear absolutely nothing. Granted, it could be the radio, because it is old and could be malfunctioning. But I’m betting it’s probably the sunsetting of a popular era which is keeping the chatter down in the world of CB radio. Last, but not least, there is the Weather Band (WB). This is not so much a separate band in and of itself, but a subset of the PB band which shares the same frequency range used by the National Weather Service (NWS) around 162MHz. As expected, I can pick up my local NWS broadcast at 162.55MHz, and the slightly robotic voice (whose accent sounds a bit Pennsylvania Dutch) is telling me everything I want to hear. It is a cool clear night and I am to expect a few more days exactly the same. Sounds perfect to me! One last nifty feature of this radio is the presence of a built-in microphone jack. 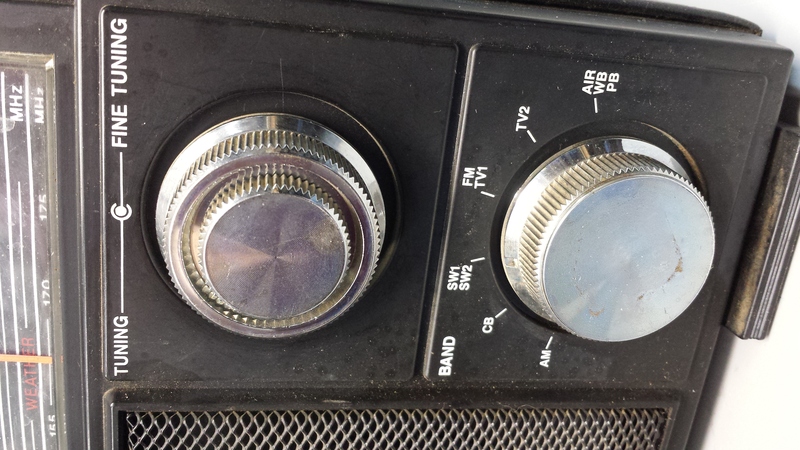 In my opinion, this is what makes the radio so fun and useful on group camping trips. 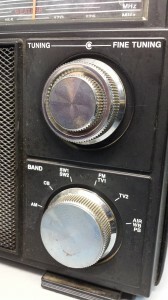 Not only is it entertaining to listen to the shortwave bands, but with a microphone plugged in, the radio doubles as a public address (PA) system and can be used to address that group of people by acting as a microphone amplifier. Perhaps the old acoustic guitar could be left at home, and with the right cabling, those joyful rounds singing Kumbya around the campfire can be performed with an electric guitar! 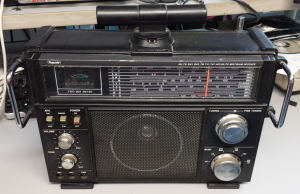 17 Comments to "Throwback Thursday – Rhapsody RY-610 Multi-Band Radio – 1990"
Awesome review! I just bid on this, and will probably buy it, but you wouldn’t happen to know where I could get the instruction manual? I’ve looked everywhere, I think, and so far, no go! Did you ever find a users manual for this RY610 radio?? If you tune in again, dial slowly, and only listen above 118 MHz. Below that (108-118) tends to be boring navigation signals. 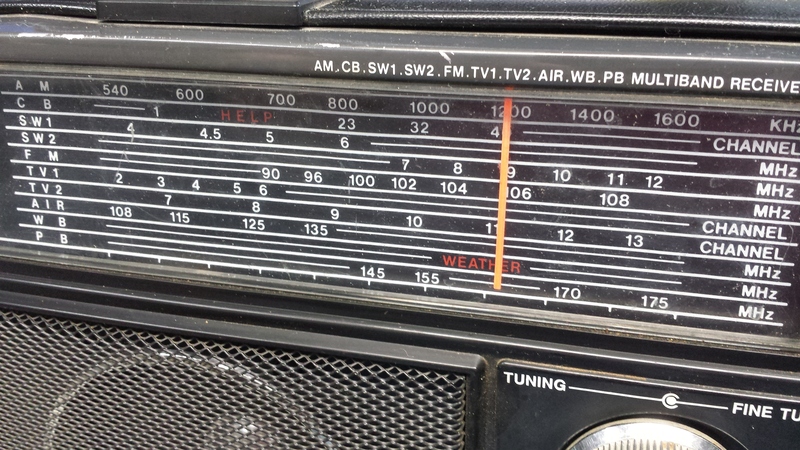 Getting a similar radio (an Emerson PM 3950) on Christmas, back in the late 70’s, was certainly a joy for me. We lived on top of a hill and there was no problem picking up signals from all over! The bands were really active back then. I wonder how long it will be before all radio bands go digital only, like broadcast TV, and the analog airwaves will effectively be history? This is the radio you choose? With the great Panasonics and Sony multiband radios from the 70’s, we see a poorly designed Chinese knockoff of these great radios? Please. I actually had this one on hand. Someday, I’ll acquire other brands of multi-band radios to do a review on. when the knobs are all crackly (volume and tone, and most other types) all you have to do is work them back and forth rapidly. may take some time but it always works. to open the case, remove the 2 long screws on the top corners, 2 shorter screws on the bottom corners, 1 shorter screw in the middle, and 1 very small screw in the battery compartment. then, the trick is, the FRONT comes off. the AM rotator bar on top is attached to the front and comes off with it. carefully unhook red and black power wires & green antenna wire. I hope you get it working. It’s a great radio, despite its novelty. Excellent article. At least one of these made it to New Zealand which I just bought at a school fundraising gala: it`s called a `PRO Series`and works fine except for the little tuning meter that I will try and find a replacement for. HobbyBroadcaster.net Learn about legal, low power radio broadcasting. The way ELECTRONICS used to be!